Secure your pool with appropriate barriers. Consider fencing your pool to avoid accidental falls and slips. You may also want to consider a safety cover for your pool or hot tub to cover while not in use. Use a pool ladder. Pool ladders should have handrails on both sides small enough for a child to grasp. This helps children get in and out of the pool safely. Keep children under active supervision. Be sure to never leave a young child unattended near water. Adults should always be close by in case of an emergency. Maintain your pool clean and clear. 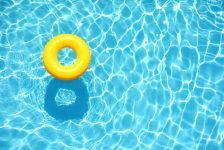 Maintaining pool chemicals balanced are important for safe swimming. If pH levels are off, this may cause irritation to the eyes or skin. For in-depth steps on maintaining your pool balance, click here.